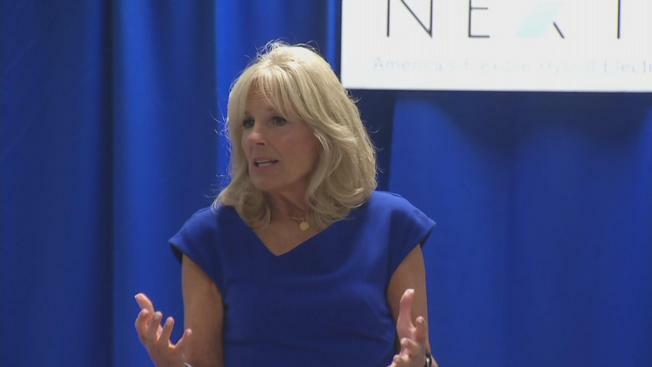 Dr. Jill Biden appeared in San Jose on Wednesday for a discussion with Silicon Valley leaders on an initiative for free community college. The vice president's wife arrived in the Bay Area in the afternoon and met with tech and manufacturing leaders in addition to stakeholders at the NextFlex campus for a roughly 90-minute program. The group talked about the America's College Promise initiative, a proposal announced by President Barack Obama last year that would provide free community college for two years to "responsible students," White House officials said. "It's all about jobs and having the best educated workforce in the world," said Biden, a college professor. A similar initiative is already working in Oakland. "Last year, we sent 300 students to college with mentors to help them get through college," Oakland Mayor Libby Schaaf said. At San Jose City College, a pilot Promise program has already helped a dozen students pay for tuition, including Klayre Guzman. "In San Jose, the Promise program paid for all our tuition and book fees," Guzman said. Now she's about to graduate from UC Davis with a degree in biology. San Jose is working on expanding the program to reach even more students, according to Mayor Sam Liccardo. "That's our ambition, to make sure every San Jose public school student can attend community college if they have demonstrable financial need," he said. The initiative could assist more than 9 million students across the country and save them an average of $3,800 in annual tuition, according to White House officials. Biden arrived from Los Angeles, where she attended a launch event for the Los Angeles Promise program, the largest city so far to advance the president's initiative, with Lt. Gov. Gavin Newsom and Mayor Eric Garcetti.